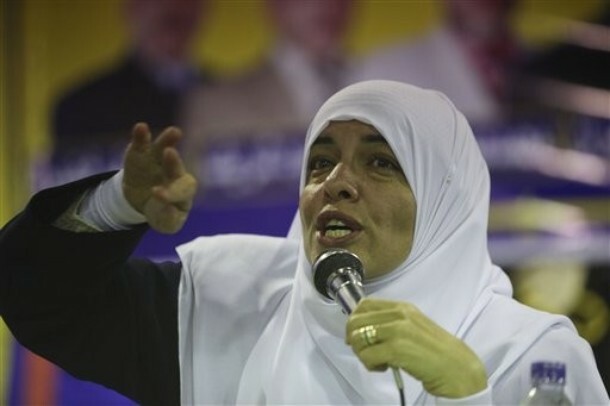 Parliamentarian Azza al-Garf is among nine other women elected (out of 498 deputies) in the first parliamentary elections after the ousting of Mubarak regime. It is worth noting that her party, Freedom and Justice Party (FJP), the Muslim Brotherhood‘s political arm, that won by mudslide, had neither played any role in the revolution nor supported it. With the dominance of the Islamists in the Egyptian parliament the civility of the country and the rights of its women and minorities are at peril. In the few interviews after she became a public figure, it became obvious that with her representation, the future of the women in Egypt look bleaker than ever, as the priorities on her agenda and that of Islamist lawmakers are to repeal the meager rights that women have earned. Practicing misogyny against women is not justifiable, yet it is the trend of patriarchal societies in general and Islamic societies in particular. It has been practiced for thousands of years by men and it is what establishes the reasons for the oppression of females in male-dominant societies. It is disturbing though when women follow the lead of men in their hatred for their own kind. Garf, an offspring of years of brainwash, is a living proof that misogyny is also practiced by women against women. Egyptian liberals and the foreign press have labeled Garf the Michele Bachmann of Cairo for her conservative views on women, not much of a compliment for anyone, to say the least. Instead of protecting and promoting women’s rights, Garf is supporting the repeal of the laws that gave women the right to divorce and that ban female genital mutilation. She didn’t object to the bill that was proposed to decrease the minimum marriage age for girls to 14 instead of 18. She refutes that women status had degraded, especially in the political arena, disagrees that women in Egypt are subjected to sexual harassment, and affirms that such incidents, if occurred, are the fault of women who are indecently dressed. Garf who suggested that all women should take cooking classes, denied these allegations and accused the media for attacking her for expressing her wishes in applying the rules of sharia in the family law. Her denial is mainly cosmetic since it is not a secret that legislating the sharia law is a top priority on the agenda of the Muslim Brotherhood, once they take over the country, and resurrect the Islamic renaissance, as they say. Her enthusiasm to curb women’s rights only proves that her loyalty is not to her gender, but to the rigid doctrine preached by the Brotherhood, which she had been a member since she was 15 years old. Garf doesn’t see that her views may cause hardships for women. She believes, like all members of the Brotherhood that the establishment of a religious society, based on the rigid interpretation of Islam, is the solution to all its problems. Such society would be the nucleus for the re-establishment of the Islamic Caliphate, which Hassan El Banna, founder of Muslim Brotherhood had called for when the organization was established in 1928. A university graduate and a mother of seven, Garf had been serving faithfully in the Brotherhood’s women’s contingent, a group tasked with imbuing other women with the group’s conservative ideology. On the outside, she looks like she has great hopes for women, but the real motives are intricately woven within her statements. “I wish she [Egyptian woman] would be more insistent to take part in the political life — to make sure her vote is not rigged and her demands are not ignored. She should be developed in all aspects: health, economic, and education —- and most importantly taking care of her family. Our families are the future of our country.” Muslim Brotherhood members are discouraged to marry from outside the organization. Garf and other women in the organization yet have a long way to go. Winning a seat in the parliament doesn’t mean that she can vote in the Brotherhood’s internal elections. She is hoping that when the Brotherhood takes Egypt towards stability and their Islamic society is instated, women within the organization will be given the right to choose their leader too.